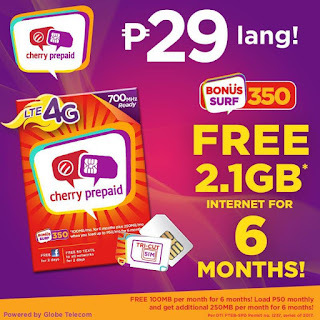 If your phone is capable of connecting to LTE network and your location is already covered by the Globe LTE network, you can use the new Cherry Prepaid 4G / LTE SIM for better and faster internet connection using your mobile phone. You can now do more than the usual call, text and light browsing services offered by Cherry Mobile. This latest product lets you do high speed internet, heavy content streaming, online gaming and even downloading big files. If you’re using the old Cherry Prepaid SIM and already upgraded your phone with LTE capability, then it’s time to change to get a new one now to fully maximize your browsing experience. If you’re asking where to buy this SIM, just head to your nearest Cherry Mobile store, kiosks and retailers to avail this new LTE SIM for only 29 pesos. You’ll also get free internet up to 6 months upon activation of your SIM card plus enjoy additional 250MB per month when you load your account with the amount of 50 pesos monthly. You can load your Cherry Prepaid LTE SIM in any Globe AutoloadMax, malls, store and remittance centers and resellers nationwide. Do check out their affordable Internet Surf Promo Offers if you’re planning to register and avail for your prepaid account. tanong ko lang po. yung cherry prepaid lte sim nyo pwd ba sa pocket wifi ng globe? maraming salamat po..